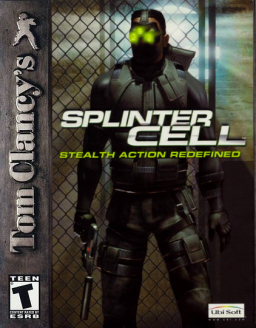 Released in 2002 for Xbox, Windows, Playstation 2, GameCube, and many other major systems for the era, as well as later on as a PS3 HD remaster, Tom Clancy's Splinter Cell is the first game in an award winning series following the activities of NSA black ops unit Sam Fisher (voiced by Michael Ironside), a member of the NSA's newly formed “Third Echelon” covert operations branch. 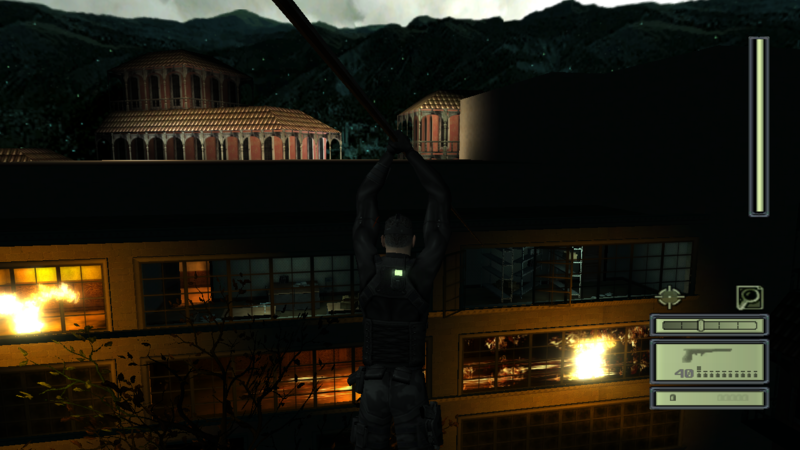 In Splinter Cell, following the assassination of the president of Georgia in April 2004, a Georgian billionaire, Kombany Nikoladze seizes power in a coup d'etat. Former Navy SEAL and Persian Gulf veteran Sam Fisher is recruited by the NSA to be the first test agent for its newly formed Third Echelon, a division of the NSA focused on information warfare, and he's deployed under the command of Colonel Irving Lambert and with the support of technical experts to carry out black missions to locate missing CIA field agents and investigate the situation in Georgia. I'll leave the details of the rest of the story untouched for those who want to play it on their own (or you can Google it if you want spoilers), but I felt this game a mixed bag when it first came out. Admittedly, I was ten years old at the time, so while I instantly fell in love with the idea of a stealthy game like this, I ended up being horrible at the game. Looking back in the future, however, I'm just as bad! The graphics looked amazing for the era, with the lighting, sound design, and stealth-based aspects being in many ways revolutionary for the genre. Which is a good thing, considering the emphasis this series placed on stealth in the first several entries to the series. Above my sidearm in the shared gameplay image, you'll notice a little bar with sections in it. This is your light meter, one of the things that really made this game stand out compared to others. How well-lit you were affected your enemies' ability to detect you, as did your noise level, which in Chaos Theory would also see its own meter for that. It paid to stick to shadows and not be as lit up and noisy as Times Square, because on many of these missions you were only allowed to alter the enemy so many times before you were called off for blowing the mission, and in some missions you had a strict "no detection, no kills" enforcement from Lambert. No matter what the mission, though silently moving through shadows is really the best way to approach this game, as you've got rather limited combat abilities, little by way of lethal ammunition, and from a gameplay perspective, I found that the game was horrible as a shooter. If that crosshair isn't perfectly still and as narrow as it gets, you'll likely miss the target, and even then, it seems like the bullet won't go right towards the target on a settled and aimed shot, meaning in the tutorial alone, I ended up patiently taking two or three shots to break a light that was ten feet away and dead in my sights. Imagine my frustration with trying a silenced shot on a guard I wanted to eliminate with my sidearm because I didn't want to rush from my hidden location to use one of those elbow hits to knock him out! With this emphasis on stealth, you're basically restricted to your sidearm, sometimes a rifle, and unlike the last two entries which had a well-integrated Krav Maga system for lethal and non-lethal takedowns, the first Splinter Cell's melee combat is restricted primarily to a couple of quick no-nonsense elbow and palm punches. You do, however, have an assortment of gadgets, both lethal and nonlethal available to you to use on mission, ranging from simple lockpicks for doors to your OPSAT for general data access and hacking, "sticky cams" that could be thrown into the distance to check around corners or create an additional vantage point to look over the area, and more. Level design was for the most part very done, although I can point to plenty of instances where trial and error was needed to get through a level in just the right way, and while the game itself looked good, the cutscenes were noticeably of a lower quality than the actual game footage, which was a bit of a letdown, though not a dealbreaker for the game as a whole. My favorite part of the level design was the integration of the various aspects of movement, which I felt the game excelled at, with the player able to navigate up pipes, kick off walls for added jump height, as well as perform the now-iconic “split-jump” to get an edge in on the enemy and avoid detection or eliminate them. Tom Clancy's Splinter Cell was the first title to a very successful franchise that now has many entries to the game on computer, console, and mobile platforms, as well as books, and from what I hear, there are talks of a potential Splinter Cell movie as well, though I wonder how that would end up fairing, considering I heard Assassin's Creed had tanked it as a movie to follow the trend of video games being generally crappy as film adaptations. This very first entry to the Splinter Cell franchise, while lacking polish in some areas, was nonetheless a revolutionary game for the stealth genre, and it's one that I've enjoyed to this day and go back to play despite its flaws that would later be polished out in later entries. If I had to give this game a 1-10 rating, I'd probably give it a solid 8/10. It had its issues, but the stealth aspects of the game are very solid, the story was good and suspenseful, and this is a game that influenced the stealth genre in many ways on its way to becoming one of Ubisoft's main flagship series.